At Sealaska Heritage, we field a lot of questions from the public, researchers and the media about Northwest Coast cultures. SHI President Rosita Worl, who is from the Shangukeidí Clan and a Tlingit anthropologist, spends considerable time answering these. Because the answers to some of these questions are of general interest, we’ve launched “Q & A with Rosita Worl” on our blog to share them with the public. This blog post concerns the sacred site Indian Point, which has been in the news recently. Q&A with Rosita Worl: What is the history behind Indian Point in Juneau and why have Native people fought to protect it? Indian Point in Juneau is considered to be a sacred site to the Auk People and other Juneau Tlingits, and numerous Native people and organizations have fought to protect it for many decades. Indian Point is as important to Native people as Plymouth Rock, Abraham Lincoln’s log cabin and the Statue of Liberty are to Westerners. The battle to protect Indian Point began in 1959 and seemingly ended in 2016 after Sealaska Heritage successfully petitioned to have the 78-acre site listed in the National Register of Historic Places, making it the first traditional cultural property in Southeast Alaska to be placed on the register. In response to this question, I want to tell of my personal experience with this issue, as it has had a profound impact on my life and marked the first time I advocated for Native people in a public arena. Shortly before my mother Bessie Quinto’s death in the 1960s, the Alaska Native Sisterhood ceremonially transferred to me her ANS kookéínaa, which is a ceremonial sash worn by members of the ANS and Alaska Native Brotherhood. Through this ceremony, the ANS announced to the Tlingit world that I was to assume my mother’s role as an advocate for Native people after her death. Bessie had worked tirelessly to secure political and economic equity for our people on multiple fronts. She worked as a union organizer for the salmon cannery workers and attended a continuous round of political meetings. She challenged the openly discriminatory practices towards the Tlingit that were prevalent throughout the 1940s and 1950s. I had been selected to assume her role because I had been under her formal training since the age of ten. My mother was a demanding teacher who observed my every action. She even ensured that when I stood or sat, I held my head in the proper Tlingit manner. Her teaching also involved bringing me to her meetings. After I received her kookéínaa, I returned home and sat on the beach in the front of our house reflecting on her contributions to the Tlingit People. Through her work and noble deeds, she had given my brothers and sisters a great gift. I wondered to myself what would I leave behind for my children. I hadn’t thought my responsibilities would begin so soon. The protection of Indian Point was to be my first public challenge. I had grown up knowing that Indian Point was a Tlingit sacred site. I don’t think I understood what the term “sacred” meant then. However, I knew that it was a significant site and special to the Tlingit. I was quite aware that I didn't have formal ties to Indian Point. We were always reminded that we were "Chilkats" or Tlingits from the Haines and Klukwan area. I recall a prominent Auk Elder, Cecilia Kunz, repeatedly telling us that we were not "Juneau People" or Auks and that Juneau belonged to them. However, the Auk People were gracious in allowing us to use their land for subsistence hunting, fishing, and gathering. One of our favorite activities was gathering herring eggs at Indian Point. Indian Point is significant to the Tlingit community. It is important to the Tlingit of the past, the Tlingit of the present, and the Tlingit of the future. It is a place where Tlingit People worked, played, laughed, and sang. It is a place where the Auk greeted their visiting neighbors. It is a place where our warriors and shamans conducted their purification and spiritual rites. It is a place that contains healing medicinal plants and powers. It is a place where our brothers and sisters, the Raven and Eagle, abound. It is a place where we buried our dead. It is a place where some day soon the Auk may reinter the remains of ancestors who were taken away in the name of science and now may be reclaimed under the Native American Graves Protection and Repatriation Act. It is the place where the spirits of the ancestors of the Aak’w Kwáan inhabit. It is a place where we sing our songs to our ancestors and call for spiritual assistance. It once was an important subsistence area until it was polluted after the non-Tlingit began to develop the northern shores of Indian Point. It is also a place that is highly coveted by others, but Indian Point is a sacred site to the Tlingit. While we may dress as White People and speak the language of the White Man, our hearts remain true to our old ways. Tlingit People have been reluctant to speak openly about our beliefs and our spiritual relationships to our ancestors lest they unleash the wrath of the proselytizing agents who sought to eradicate Native spiritual beliefs. We, people who grew up during a period when Tlingit culture was repressed and were punished for speaking our language, have been hesitant to openly discuss our beliefs lest we subject ourselves and our children to ridicule. However, we ultimately came to realize that we had to explain our spiritual beliefs so that non-Natives would understand our opposition to the construction of a governmental facility or other development at Indian Point. Tlingit People are culturally different than the larger society simply because we have different cultural beliefs and practices. We conceive of space, time, life, and death in a different way than non-Tlingit. Indian Point is a burial site, but it is unlike a Western cemetery. As I understand when Westerners and those who adhere to their beliefs bury their dead, they believe that their souls go to a place called Heaven or Hell. They do not seem to mind if their graves have to be moved to make way for progress and development. I respect the rights of those who espouse such beliefs, but their beliefs are unlike traditional Tlingit ideologies. Traditional Tlingit People believe that when we die our spiritual being divides, with one part going to a supernatural abode and the other remaining at the site where our physical remains are interred. We respect the burial grounds inhabited by the spirits of our ancestors. Sacred grounds, such as Indian Point, bond us to the land, they unite us with our ancestors, they unify us with our living Tlingit brethren, and they ensure our survival as Tlingit People through future generations. The spirits of shamans remain powerful even after their death and can also bring harm and good will and fortune depending on who and the manner in which his or her spirit is approached. Burial sites embody the Tlingit cycle of life-death-life. Even to this day as I fly into Juneau and pass Indian Point, I call for spiritual assistance, and I reach to my heart to throw out any illnesses I may have. This site is sacred to the Aak’w Kwáan . Indian Point is sacred to the Tlingit. We Tlingit, who are from other areas outside of Juneau, acknowledge the aboriginal tie of the Auk to Juneau and Indian Point irrespective of the fact that the Auk no longer hold legal title to the land. We stood unified with the Auk People because of this recognition and because we share the same beliefs and concerns. We knew that if the desecration and destruction of this sacred site could occur, it would occur elsewhere. Shortly after receiving my mother’s kookéinaa, I learned that the City of Juneau intended to rezone and subdivide Indian Point and to sell residential lots. The Native community was extremely upset. We all knew the significance of Indian Point. I called my fellow brothers and sisters from ANB and ANS to testify at the city council meeting in opposition to the proposed action. I was joined by several other Tlingit People. I thought we should have a greater representation, and I ran out of the meeting onto the street and asked those Tlingit People who I saw to join us and to testify against the action. I also called my friend, Tommy Richards, who was a reporter with the Tundra Times, the statewide Native newspaper, to help us by bringing attention to our plight. We were successful in persuading the city of the importance of Indian Point to the Tlingit, and they tabled their action to sell the residential lots. In retrospect, I can see that we were quite naïve in thinking that Indian Point would be forever protected. When I assumed my second term as Interim President of the then Sealaska Heritage Institute (SHI), I was startled to find amidst the mounds of paper on my desk the draft Environmental Impact Statement (EIS) on the proposed development of Indian Point. Nearly 30 years after my first episode with Indian Point, the federal government proposed to build an office complex and research center there. I immediately held a meeting with our SHI Board of Trustees. I briefed them on the proposed action, and one Trustee who was also a clan leader told me in no uncertain terms that we would die to protect the burial sites of our shamans. I quickly reviewed the EIS and noted that the legally required "consultation" with the Native community had not occurred. I instantly wrote a letter to that effect and cited compliance other cultural, historical, and archaeological resource laws. An archaeologist who had been under contract to assess Indian Point visited me. He advised me that he had met and consulted with a number of Tlingit Elders to discuss the project. I reminded him that discussions with individual Elders did not constitute consultation. The federal National Oceanic and Atmospheric Administration (NOAA) organized a series of meetings with myself and with the community. One meeting in particular stands out in my memory. We met in the Centennial Hall and a number of Tlingit People testified to the representatives of the federal agency about the importance of Indian Point. We cried as young Tlingit women and men tried to hold back their tears as they spoke about the significance of Indian Point and their concern about the potential desecration of the site. A young man from Angoon told of burning food there to transfer the food to his deceased relatives. One of the federal agency officials asked me what could be done to "mitigate the adverse impacts." I recall thinking to myself for a moment and then offered that I didn't know if spirits could be contained to a specific area if a fence were to be constructed to keep the spirit contained and the public away. I also emphasized that our sacred sites were unlike that of non-Natives, whose sites could be deconsecrated such as a church that was transformed into a meeting hall. I told them, however, that I would think about their question. NOAA offered us $1 million and 50 acres of land if we would drop our opposition to the construction project at Indian Point. They offered that we could use the funds to build a village at another site. We were indignant with the offer. We sadly recognized that some of our People might not hold Indian Point in the same regard as we and could well be tempted by the $1 million offer. The powerful governmental entity wanted the Auk and the Tlingit to redefine and restructure their culture and ideologies to meet its need. The Clan Mother of the Auk, Rosa Miller, adamantly opposed the destruction and desecration of their sacred site. She did not believe that the sanctity and spiritual attributes of Indian Point could be transferred to another site to satisfy the federal agency. The Auk immediately rejected the offer. The Tlingit community stood solidly behind their decision. The Native community, including the Aak’w Kwáan, Douglas Indian Association, ANB, ANS, Central Council of Tlingit and Haida Indians of Alaska, Sealaska Corporation, and SHI opposed the construction of a building at Indian Point. One Tlingit, who had lived away from home for decades, however, urged her fellow Auk to accept the offer and warned that they would probably lose anyway, and the powerful government would eventually build on the sacred site. Clan Mother Rosa Miller knew that if her People accepted the money, they stood to lose intangible treasures of their heritage that no amount of money could buy—least of all their honor. This Clan Mother, who was trained through her lifetime in the ways of her ancestors, stood her ground against the federal government. We asked NOAA to consider the other two sites that had been identified in the Juneau area as possible sites for the facility. We understood that some within their ranks viewed one of the sites as acceptable. I also asked that a Traditional Cultural Property (TCP) evaluation be conducted. I had attended a Keepers of the Treasures meeting sponsored by the National Park Service in the Southwest and learned about TCPs. I thought that Indian Point was a perfect candidate for a TCP. Although I am an anthropologist and was thoroughly familiar with the history of Indian Point, I knew full well that the government would not ask me to conduct the study. I suggested a number of possible anthropologists who were familiar with the Tlingit culture. A colleague at the University of Alaska was contracted to do the study. Additionally, NOAA also contracted with a traditional Tlingit leader to meet with the Auk People. I interpreted his retention as a measure to divide the Tlingit community. I was called into the office of the chief executive officer (CEO) of Sealaska Corporation. Sealaska Corporation is the regional Native corporation established under the Alaska Native Claims Settlement Act of 1971, which settled our aboriginal land claims with the government. Sealaska Corporation, in turn, had created an affiliate organization, the Sealaska Heritage Institute, whose mission was to protect and perpetuate the Tlingit, Haida, and Tsimshian cultures of Southeast Alaska. The CEO advised me that the powerful Senator Ted Stevens of Alaska had called him and asked why the Tlingit were opposing the construction of the NOAA facility. The Senator conveyed that he was trying to help the economy of Juneau. Our CEO responded that when it came to cultural matters, he was required to yield to the traditional leaders and Elders. I also reminded our CEO that very few of our tribal members had jobs with NOAA. I was also to learn later that the new facility would be named after our Senator Stevens. Those who supported the construction of the NOAA facility at Indian Point blamed the Native community for the delay of the construction project. They claimed that we would be responsible if the funds for the NOAA facility were lost. From my perspective, the delay in construction could not be attributed to the Native community. Had NOAA met the federal requirements of consultation, they would have learned that Indian Point is a sacred site. They would have known that the Tlingit community would oppose the development on these grounds, and perhaps they would have known that they should have selected an alternative site for their facility. I was at a loss to understand why it was expected that Indians must allow one of our sacred sites to be put in jeopardy and to sacrifice our beliefs because a governmental entity wanted to build an office facility on our sacred lands. I was exasperated that federal employees rejected another possible site for the construction of the facility as “not acceptable” because the 45 minute drive was too far for the employees to travel. The Auk People had lost all of their traditional territory to those of us who have moved into Juneau. Today we enjoy the beauty and bounty of this land. We felt that it was imperative that the Auk and the Tlingit People be allowed to maintain this sacred site. The Tlingits’ fight to protect Indian Point finally paid off. The battle with NOAA ended in 1998, when the federal agency selected a different site outside of Indian Point to construct its facility. In 2002, we nominated Indian Point for inclusion in the Federal Register and submitted the nomination to the Alaska State Historic Preservation Office (SHPO). Subsequent to the nomination, we continued to respond to the seemingly unending questions posed by SHPO. I attended a Historical Commission meeting in Anchorage to request the status of our nomination and was advised that approval was imminent. However, when I attended a follow-up meeting in Juneau in 2006, we were again asked for additional information, which again we provided. We contacted the office several times asking about the status of the nomination. I had been advised that the federal government determined Indian Point to be eligible as a TCP and eligible for inclusion in the National Register of Historic Places. However, we continued to await the SHPO decision. Native People have had a strained relationship with the State of Alaska over the protection of our subsistence rights under federal law. Later, I wrote yet another letter to SHPO asking for its decision. As a member of the Board of Directors of Sealaska Corporation, I reported to the board that we had been actively working on a TCP nomination for more than ten years. I conveyed that we needed another mechanism to protect our historical and sacred sites in view of the time and energy we had expended to try to protect one sacred site. I reported to the board that we were preparing to publish a cultural atlas which included more than 3,000 Native place names, and I felt that we had to do something different to protect our sacred sites. I proposed that we look at the possibility of creating a Tongass Heritage Area. At the same, we were working to finalize Sealaska Corporation’s land entitlement in Congress, which would require an amendment to the Alaska Native Claims Settlement Act. The board of directors decided that we would include in the proposed legislation 4,000 acres for sacred and historic sites. Corporations do not generally own nor seek the ownership of non-productive or non-economic lands. We, as a Native corporation, however, viewed our cultural survival and the protection of our sacred sites as major objectives along with our financial considerations. At that time, we had legislation in Congress to amend ANCSA to allow us to select and to maintain ownership of a significant number of our sacred sites. We also continued to advance the notion of Heritage Areas as another mechanism to protect our historical and sacred sites. Indian Point offers a clear lesson that can be learned or affirmed that we as Native Americans view the protection of our sacred sites as essential, and we will avail ourselves of every mechanism to protect them. We are not apologetic that our cultural beliefs may conflict with Western values, stand in the way of progress, nor halt construction of a new facility. Our cultural values must be interpreted and applied on their own merits and must not be defined nor structured in the context of national laws or needs. Dr. Rosita Worl is an Eagle of the Thunderbird Clan and House Lowered from the Sun of Klukwan. She is a child of the Lukaax.ádi. She serves as President of the Sealaska Heritage and was a former board member of the Sealaska Corporation and the Alaska Federation of Natives. Dr. Worl recently received the Solon T. Kimball Award for public and applied anthropology from the American Anthropological Association. The Juneau Tlingit have worked diligently to protect Indian Point from the intrusions of modern development for over 50 years. 1969, when the Juneau Indian community objected to a proposal by the local municipality to subdivide Lots 3 and 4 and sell the land as residential lots. 1990s, when the Tlingit united in opposition to the construction of a marine laboratory. In 1959 the National Park Service sought to acquire a portion of Indian Point for use as an administrative headquarters. Their selection included Herring Cove (now called Indian Cove), an area used traditionally by the Juneau Indian community for harvesting herring. The local Alaska Native Brotherhood and Sisterhood, on behalf of the Auk Kwáan, objected to the proposed transfer, stating that Herring Cove was their campsite for fishing and preparing of foods for generations down to the present. The ANB and ANS identified an area approximately 300 feet back from the beach all along the westerly side to be designated for the exclusive use by the Natives in their customary manner. NPS made no objection and the public land order reserving this tract for the NPS includes a provision that it “shall not be construed to affect or to impair any rights or privileges the natives of the area may have to the use and enjoyment of their established campsite on the south shore of Herring Cove in their customary manner.” This provision remains in effect today. In 1968, the State of Alaska transferred 24 acres of undeveloped land on Indian Point (Lots 3 & 4) to the Greater Juneau Borough for $1.00. The area was zoned for residential development. The Auk Kwaan, Native organizations, local Indian residents and borough citizens initiated a campaign of letters and public testimony to protect Indian Point and maintain it in its natural state and preserve the traditional cultural practices associated with it. At a public hearing in May of 1969, eight members of the Auk Kwaan and representatives of the ANB and Tlingit and Haida tribes stated that the Tlingit have always utilized this area for harvesting herring eggs, catching herring and smoking fish, as well as a picnic area. They pointed out that this is the last area in Juneau where herring eggs may be obtained. On July 2, 1969, the Greater Juneau Borough passed an ordinance (No. 69-3) converting Lots 3 & 4 from a residential to a public use district and classified the area as “recreation land to be used in its natural state” that “shall be kept open and clear” for public access and enjoyment. Furthermore, any recreational improvement was prohibited except as may be expressly authorized by the Assembly in the future. NOAA offered $1 million and land within the Auke Recreation Area to the Indian community if they would drop their opposition. The Clan Mother of the Auk Indians adamantly opposed the destruction and desecration of their sacred site, and the Auk immediately rejected the offer. Although some individuals were not in agreement with this position, all of the local and regional Native organizations in Juneau stood solidly behind the Auk decision. Sealaska was prepared to go to court to defend the site. The rationale for this sentiment was expressed by Worl in these terms: “The Auk have lost all of their traditional territory to those of us who have moved into Juneau. Today all of us enjoy the bounty of this land. We felt it was imperative that the Auk and the Tlingit people be allowed to maintain this sacred site” (Worl 2009:62). 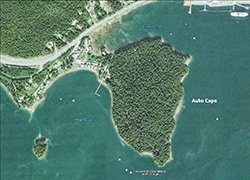 NOAA/NMFS eventually selected a location at Lena Point due in large part to the social action of the greater Juneau Indian community to express and advocate for the high cultural and historical value placed on the property by the Auk Kwáan, and the determination of Sealaska Corporation to oppose the construction at Indian Point in court if needed. The Traditional Cultural Property investigations reported that Indian Point is a shamanic landscape associated with Indian burials, including shamans, and is considered a spiritual place and a ceremonial area which has ongoing sacred significance associated with religious practices of the Juneau area Indian community. Indian Point was the first home of the Auk Tlingit in this area and was the site of a significant event in Auk history during which the leader of the principal clan defended Auk ownership of the area. The southern tip was the site of a fort or lookout station from which the local community defended its territorial claims, and was the locale of houses, smokehouses and Indian graves. In another location, documented Indian burials are situated in close proximity to four canoe runs and a midden dating to A.D. 1160-1345. Indian Point was a highly productive locale for subsistence resources and is most noted as a source of herring and roe until the run collapsed in the 1970s. Finally, the landscape is largely undisturbed by Euro-American development and its environmental and cultural integrity has been maintained. The vision of this plan regarding the cultural significance of the Auke Bay Area to not only the Áak’w Kwáan, but to all Tlingit and Alaska Native people, must be to protect the sacred sites in the Auke Bay area and surrounding environs. Guideline and Consideration for Subarea 3 in the 2013 Comprehensive Plan seems inconsistent with Alaska Native concerns, as the development of this area as a cultural park would be culturally insensitive, and such development is opposed by the people it was intended to honor. Goal 2: Preserve Indian Point through rezones, easements or other preservation methods which limit activities allowed on the site, and amend the CBJ Parks and Recreation Comprehensive Plan to further limit activity at Indian Point. SHI formerly was known as Sealaska Heritage Foundation.